TLDR: Snow continuing in waves with an additional 8-12″ of snow for the mountains from Saturday through Monday. A Winter Weather Advisory is in effect for the Wasatch and Uinta Mountains through 4 am MST Saturday morning with accumulations of 3-8″ tonight. Let it snow! It’s been snowing in waves around northern Utah mountains since Wednesday. So far, Alta has gotten 15″ of snow and Snowbasin a whopping 21″. At least 10-14″ of snow has been reported across resorts statewide today. Below is a webcam of Alta’s sugarloaf peak at 4:35 MST today. Looks like it’s coming down pretty hard! In addition, the National Weather Service office in Salt Lake City has issued a Winter Weather Advisory for additional snow amounts of 3-8″ is in effect until 4 am MST Saturday morning for the Wasatch and Uinta Mountains. Snow showers should continue off and on throughout the day today as a trough overhead progresses into the Rocky Mountains. Expect an additional 3-8″ of fairly powdery snow through early morning Saturday, tapering off by 4 am MST. Another system associated with the Pacific jet moves in Saturday afternoon, with maximum height falls occurring Saturday evening and Sunday morning. 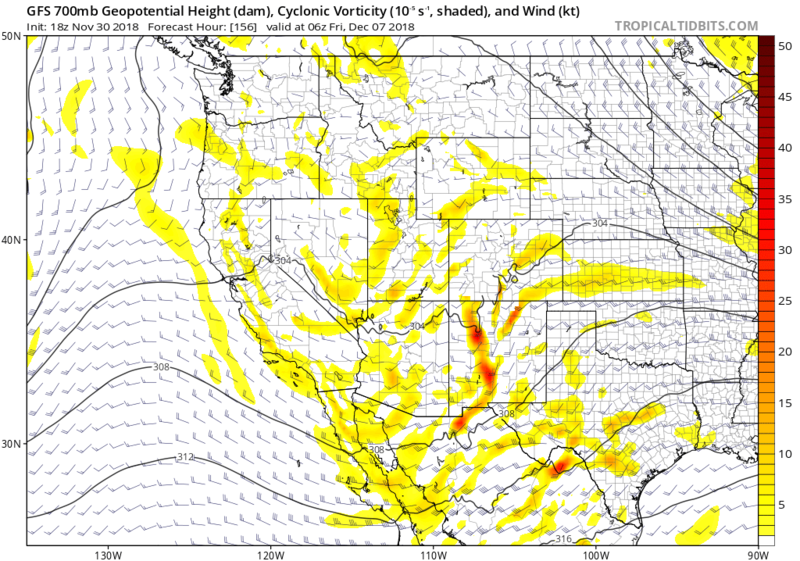 Even though heights should rise gradually Sunday evening into Monday, there likely will be enough unstable, cyclonic flow to create instability showers, especially in higher terrain. This means we should have more accumulating snowfall in the mountain resorts from Saturday through Monday afternoon. Additional accumulations look to be in the 8-12″ range during this time for most Utah mountain resorts. Below is the 12Z ECMWF forecast for total precipitation from 12Z (5am) this morning through 18z (11am) 4 Dec (Monday). 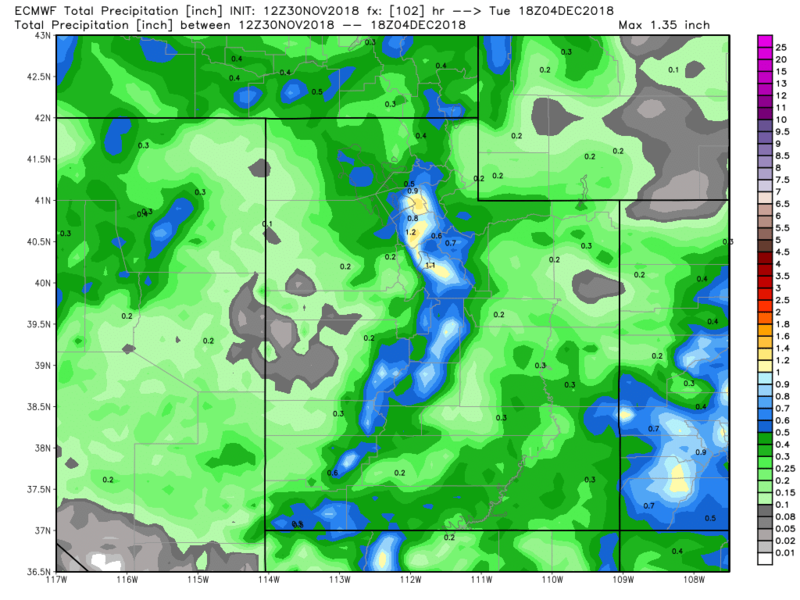 The Euro predicts an additional 0.8-1″ of precipitation outside of what has already fallen today. Ridging moves in next week Tuesday, but a) will not be nearly as strong as recent high pressure events in that it will be “flat” and more “zonal” and b) looks to be exiting rather soon too. 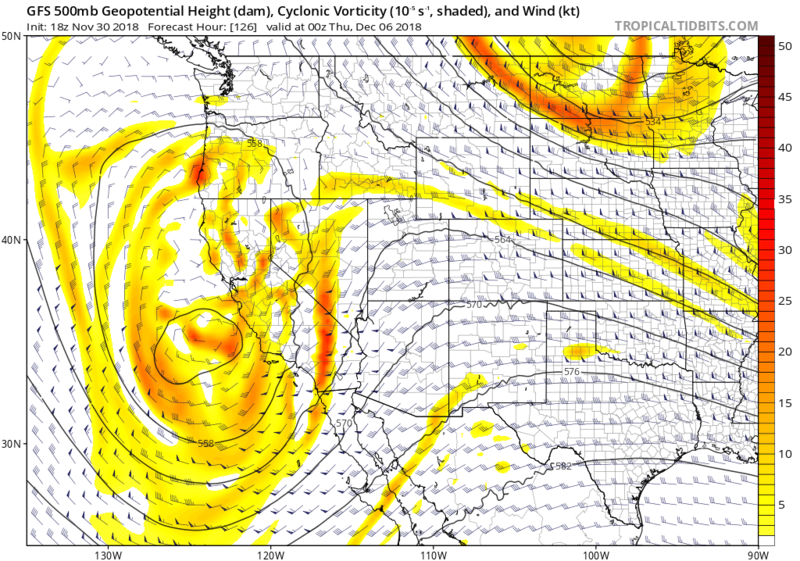 A closed low looks to move onto the coast of California by Wednesday afternoon. Flow looks like it will be “split” between the southern branch of the jet south of the closed low and by flow to the north associated with the northern branch of the polar jet. These two flows will merge over our area during the day Wednesday, and a mid to upper level trough will pass through our region Thursday. With the availability of moisture from the southern branch of the jet, there should be a rather large chance for additional light accumulations of mountain snowfall. GFS 500 mb vorticity chart valid 00Z 7 Dec (Wednesday evening). Not the closed low along the California coast, and flow splitting around it to the south and to the north (associated with the polar jet). 700 mb vorticity chart valid 06Z 9 December (Thursday night). At this time, a weak low to mid level (700-500 mb) trough is pushing through the area. This gives us the potential for some instability and light precipitation across the region Thursday afternoon through Thursday night. Beyond that, ridging looks to build it quite strongly across the region after Thursday, perhaps staying put until Tuesday of next week. More on that in future posts. In the meanwhile, temperatures should be at or slightly above normal in the mountains next week, making for absolutely perfect skiing conditions! Enjoy the snow this weekend (I know I will) and stay tuned for more info regarding next week’s potential system. Previous Previous post: Break’s over, back to snowing!